Part of how we see God is determined by how we listen to God. There is so much noise and movement in the world that competes with images of God. This noise would drown out God’s beckoning voice and distract us. We may not sense what spiritual directors refer to as the thin place—God come near. 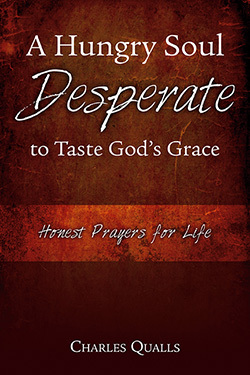 Charles Qualls’s A Hungry Soul Desperate to Taste God’s Grace: Honest Prayers for Life offers readers prayers for that journey toward the meaning and mystery of God. Charles Qualls is the Associate Pastor for Pastoral Care at Second-Ponce de Leon Baptist Church in Atlanta, Georgia. He earned his bachelor’s degree at the University of West Georgia in Carrollton, his Master of Divinity degree in Family Ministry/Christian Education from Southern Baptist Theological Seminary, and his Doctor of Ministry degree from Mercer University. I cannot believe there is anyone whose life wouldn’t be subtly and meaningfully enriched by spending an hour or two in the pages of A Hungry Soul. For a half century, I have directed people who wanted to know how to pray to the prayers of a French monk named Michel Quoist. Now when they ask me, I will direct them also to A Hungry Soul, an exceptional collection of prayers by a Baptist pastor from Georgia named Charles Qualls. You will learn from both how to converse and commune with God in ordinary happenings of everyday.